Tirana was our first stop in Albania. 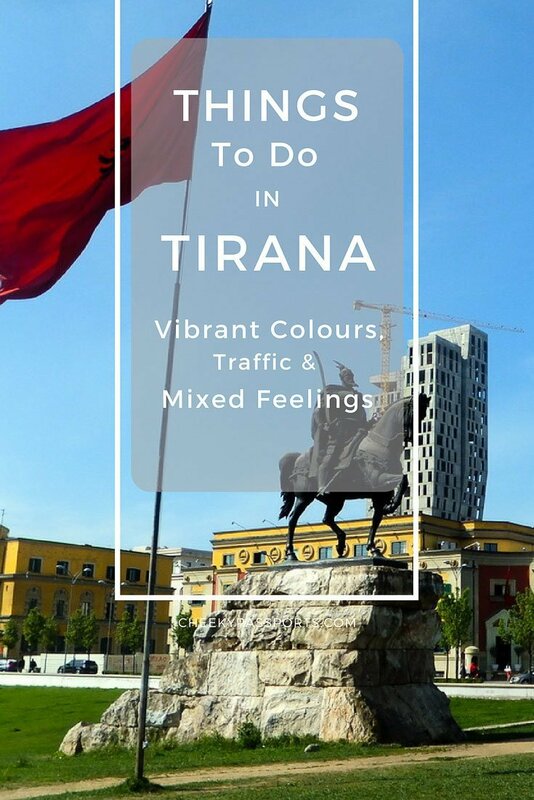 Armed with a short list of things to do in Tirana, we arrived there late at night, after driving through an unlit highway full of goats, donkeys and pedestrians. There were traffic police practically at every petrol station we passed along the way, and the road seemed never-ending, probably because we could never gain speed due to its poor condition. As we approached the capital city, the traffic became more chaotic, traffic rules were non-existent and we desperately tried to guess (often wrongly) the other hundred motorists’ next moves. We had been strongly advised against driving in Albania at night but we had taken a few unexpected detours along the way and were running late. 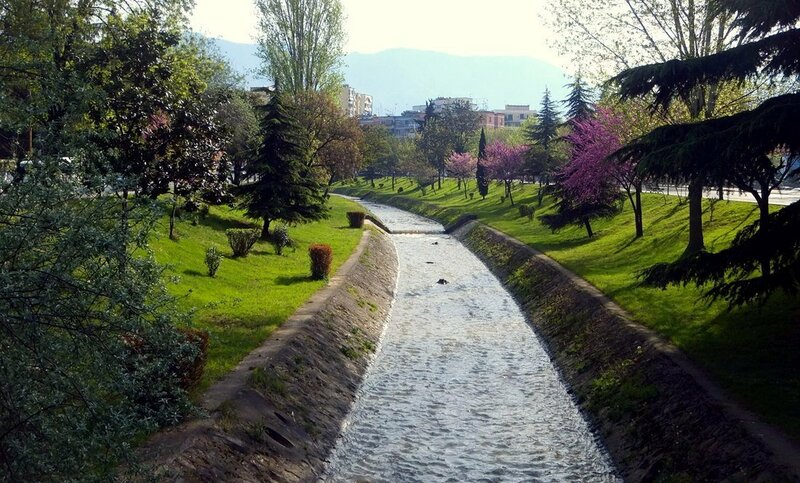 We were hoping to complete our list of things to do in Tirana the following morning, after a little rest. We arrived at our guesthouse, run by a sweet older couple and checked in. When we asked where to park the car, the owner led us to the makeshift corrugated metal door of a construction site situated about twenty metres up the road and knocked loudly. Another man opened and after some discussion it was agreed that we would be allowed to park amid the construction rubble for the night… not quite what we expected! The car was covered in building dust and mud the next morning as the builders worked around it but hey, it was still intact so that was ok I guess! We immediately went out to a delicious dinner of seafood pasta and gnocchi covered in a fresh, herby, tomato sauce at a restaurant that we had read about and were keen to try out. 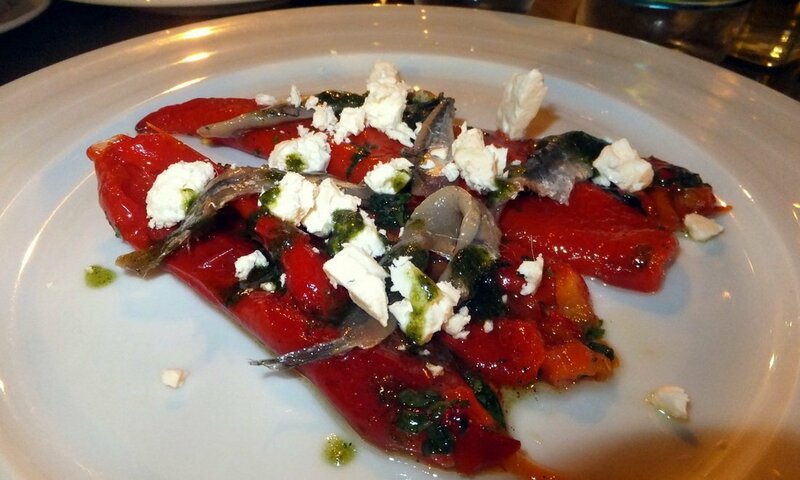 We also sampled some starters including dips and fresh bread and a lovely dish of roasted red peppers with Albanian cheese and anchovies. The bill for all of the food also including one dessert, a few glasses of red wine and water added up to about 22 euro. Wifi at both the guesthouse and the restaurant was very fast. The next morning we set out to explore and check our list of things to do in Tirana. We quickly found out that the city is very dusty as we both sneezed our way to the Piramida, a rather bizarre structure which was once a museum but has now become a shabby, derelict building covered in graffiti and broken glass. 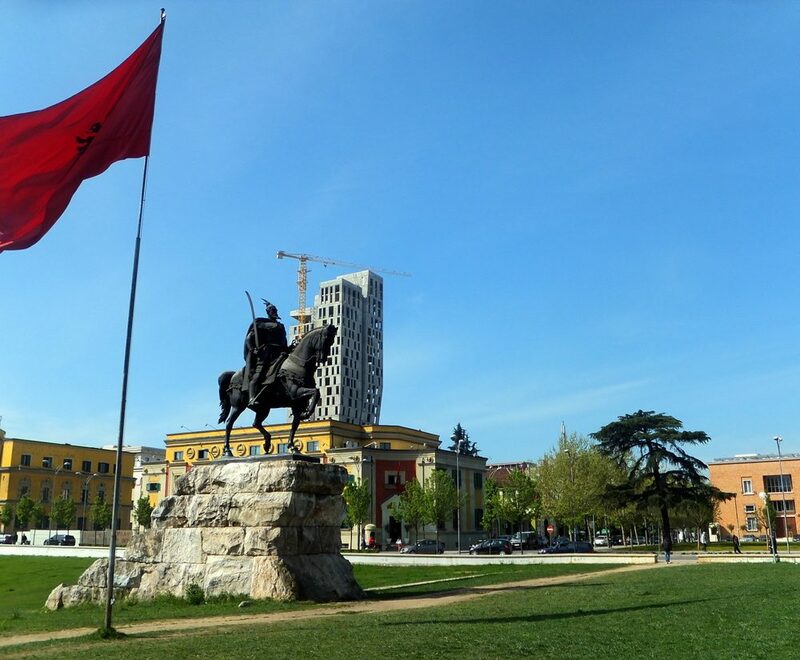 Most of the things to do in Tirana are located in the city centre near Skanderbeg Square which is more or less one big roundabout. As we made our way towards it, we noticed that the posts actually holding up the traffic lights, light up too. We thought that gave a rather unusual funk to a city! It’s a shame that we didn’t think of taking pictures of them. 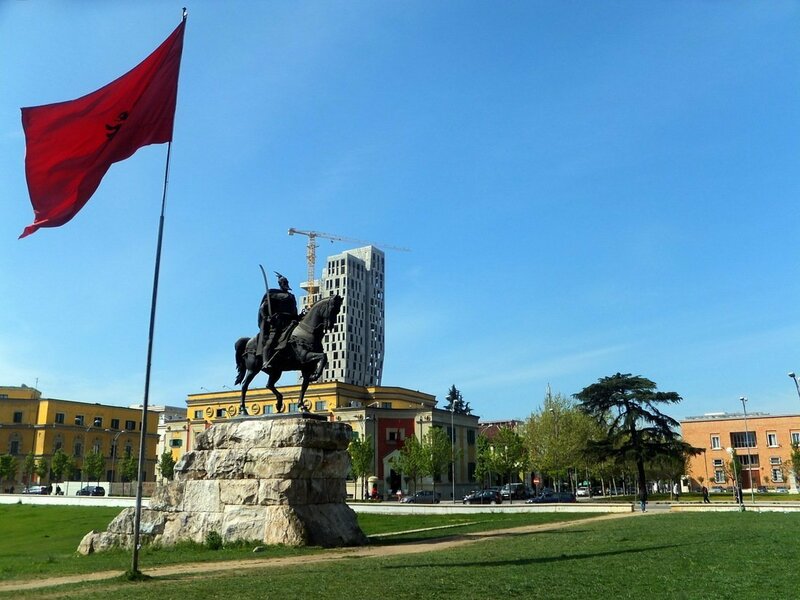 Skanderbeg monument and the blood-red Albanian flag stand proudly in the middle of the square whilst the Et’hem Bey Mosque and clock tower both lie to one side of them, across the road. Unlike many other religious structures, the mosque was not destroyed during Hoxha’s atheist rule. Whilst appreciating its historical and religious significance, we both agreed that the structure was not particularly beautiful or gorgeous on the outside (as it has very often been described). Unfortunately, it was closed so we did not get to see inside; perhaps we would have been more impressed if we did. 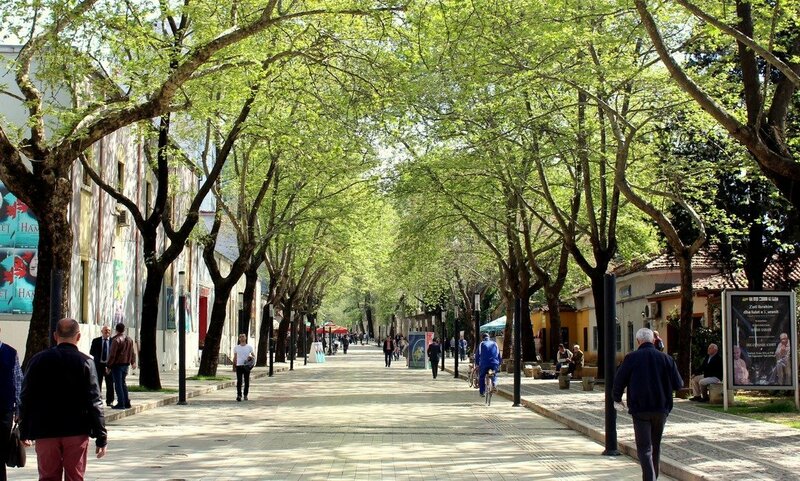 Amid the chaos we were happy to find the Rruga Murat Toptani, a peaceful, pedestrian, tree-lined road which provided a welcome break from the city traffic. Finally I felt that I could breathe properly and cool off! 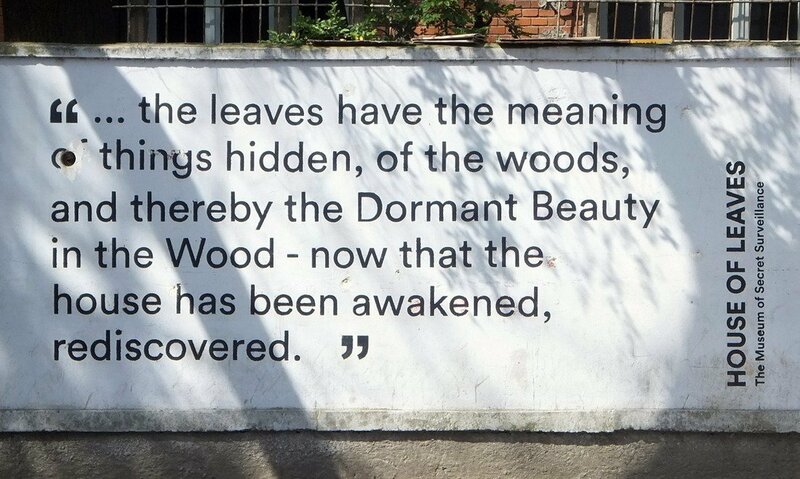 The building seemed to be closed so we could not find out what the mysterious-sounding House of Leaves represented. 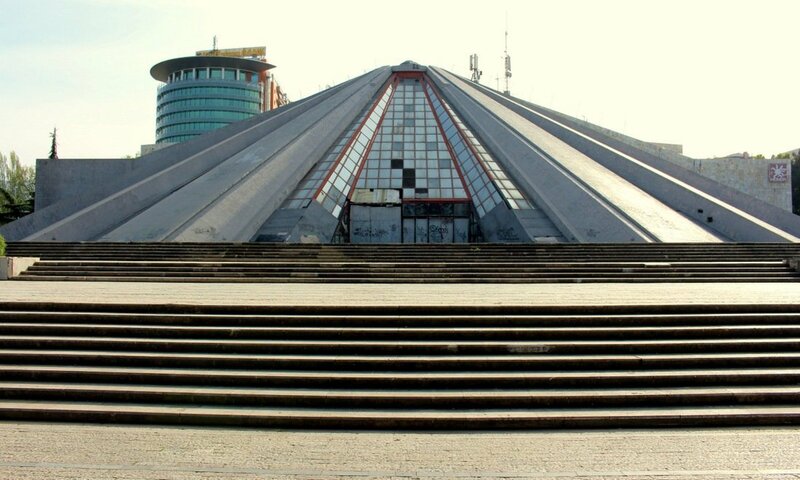 I googled it as soon as I found an internet connection and discovered that it is a former state security building used by the secret police as the main centre of interceptions during the communist regime. Pretty fascinating! There are plans to turn it into a museum and open it up to the public but it seems that an official opening date has not yet been set. 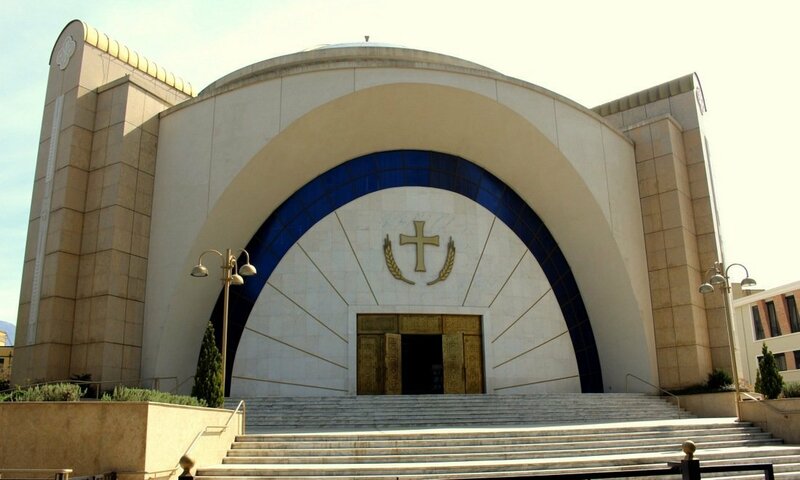 On the opposite side of the road lies the Resurrection of Christ Greek Orthodox Cathedral, a modern-looking church with an interesting bell and clock tower. 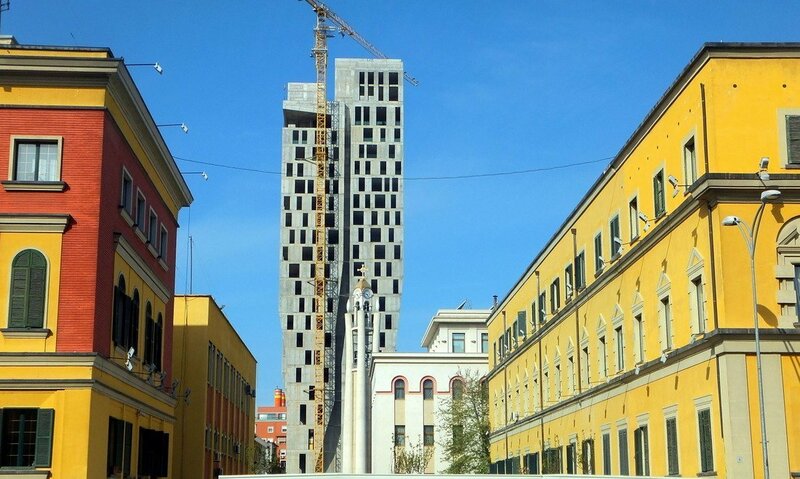 I wanted to love Tirana. I really did. I had a romantic notion of a slightly strange, disorganised, shy youngster boldly emerging into a more sophisticated world. But despite her chaos, I found her to be too soulless, too uninspiring. Maybe I did not spend enough time getting to know her; maybe I needed to look into her in more depth to see her appeal. Maybe one day I will meet her again.